Airships navigate through the air with their own power and are lifted into the air with hydrogen and helium. The various types of airships are predominantly being used for surveillance purposes as the safety has become a growing concern in the recent times. The low maintenance cost of airships and their ability to offer surveillance to large areas are acting as key growth drivers for the global airships market. According to the research report, the global airships market is projected to be worth US$273.2 mn by the end of 2024 as compared to US$152.8 mn in 2015. During the forecast period of 2016 and 2024, the global market is expected to expand at a CAGR of 6.5%. Innovative approaches towards advertising and market are also influencing the global airships market to a large extent. Advertisers are opting for airships are they cover bigger areas, have improved visibility, and remain stationary. Thus, the cost-effectiveness of airships and their returns on investment in the field of advertising are making a significant impact on the overall market. The tremendous capacity of these airships to handle weight has opened up the opportunity for these airships in the logistics sector. However, the global airships market faces a few challenges. The usage of hydrogen exposes these airships to the risk of inflammation, which can lead to fatal accidents. In view of these risks, researchers are working on developing hybrid airships that will partly operate on solar energy to mitigate the possibility of hazardous accidents. On the basis of type, the global airships market is segmented into semi rigid airships, rigid airships, and non-rigid airships. Of these, the non-rigid airships are anticipated to lead the global market are they are priced low. Furthermore, several marketing agencies and companies are opting for non-rigid airships as they are exceptionally light in weight. Airships are being used for research, commercial tours, advertisements, cargo transport, and surveillance amongst others. Currently, the advertisement and surveillance segment is defining the success of the global market. The soaring demand of airships for advertisement will be attributable to the tremendous exposure airships can provide by raised in the middle of the sky. Furthermore, the rising demand for safety has triggered an urgent need for surveillance of large areas. 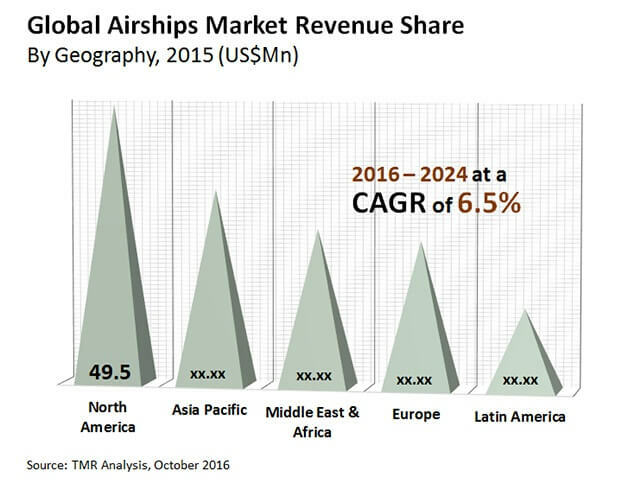 Geographically, the global airships market is segmented into North America, Europe, Asia Pacific, the Middle East and Africa, and Latin America. Of these North America is projected to dominate the global market as the U.S. will register maximum demand for airships. The dominance of this regional market will be due to the strong presence of manufacturers in the country and development of technologically advanced products that overcome challenges such as high inflammability of hydrogen gas. Analysts predict that non-rigid airships will show significant sale in the global market while the surveillance segment will witness a remarkable adoption of airships. Europe has also been observed as an emerging airships market as they are being adopted with the rise of the tourism industry. Some of the leading players operating in the global airships market are Lockheed Martin Corporation, Zeppelin Luftschifftechnik GMBH, Hybrid Air Vehicles Ltd., Lindstrand Technologies Ltd., and Shanghai Vantage Airship Manufacture Co. Ltd. Analysts have observed that are several emerging players in the global market, which is anticipated to intensify the competition in the coming years.